Tiny houses solution to water management. Tiny houses have been trending for the last ten years and have grown in popularity by 200% in the last few years. They are part of a social movement where people are choosing to downsize their living space. People are joining this movement for many reasons, but the most popular reasons include financial concerns, environmental concerns, and the desire to live a simpler self-sufficient sustainable life. A standard American home averages about 2600 ft and costs about $254,000. A tiny house runs between 100 & 400 sq feet and the cost can range from $5000 to $100,000, and almost all tiny homes are customized. Americans spend between one third and one half of their income on housing, carrying large mortgages. Sixty-eight per cent of people who live in tiny houses own their house outright, and the cost of carrying a mortgage is low. Tiny house communities are now being developed in certain municipalities to address homelessness. Tiny houses are being built as add-ons serving as mother-in-law suites, guest houses, air B&Bs, home offices, studios, etc. It is becoming popular for retirees to build several low cost tiny houses in different areas, so they have a home in many places. In addition to lower costs the tiny house is more environmentally friendly. It uses less energy 774 kilowatts annually compared to 12744 annually for standard home and on all levels, creates a smaller carbon footprint. Many tiny houses are mobile, but just as many are stable and stay in one place. The tiny house movement encourages people to build sustainable, self-sufficient homes, and many homes are built off the grid. Solar powered, rain catchment, greywater recycling, composting toilets. etc. The tiny house earthship is totally inspiring. 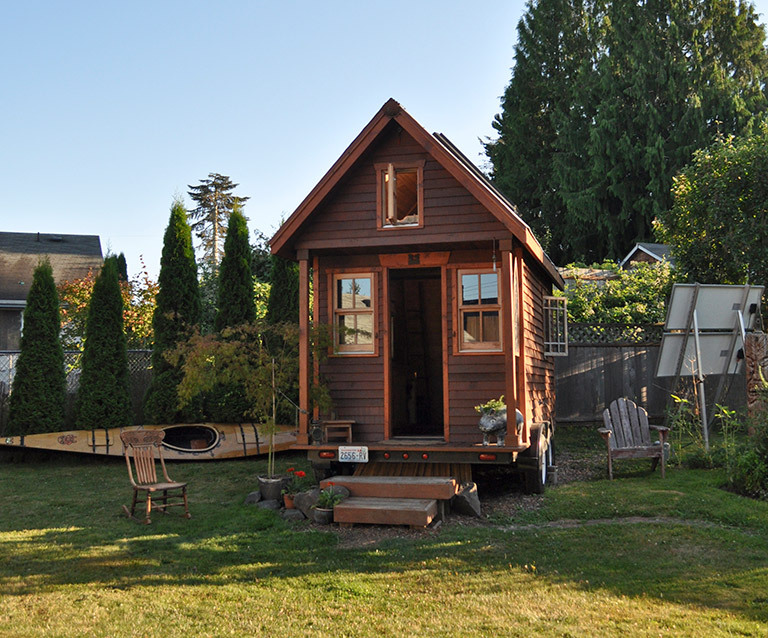 The strength of the tiny house movement is its simplicity. Although this lifestyle isn’t practical for everyone, you can easily apply a few lessons from the tiny house movement to your own regular-sized home. Consider reducing energy usage, buying less stuff, choosing green building materials, installing greywater reusable systems to water your plants and gardens, and generally spending more time outdoors. Tiny houses may be just one answer to living in a more environmentally friendly way, but they can also serve as inspiration. Of course, there are many aspects one must consider when building a tiny house. The why, where, and how. One must consider the zoning rules and regulations in the areas where the house is to be built. Today we are going to focus on the greywater solutions for your tiny house. To live in a tiny house, especially if you want to live off-grid, you must consider your waste water. There are two types of waste water: black water & greywater. Black water is waste from your toilets. If you own an RV, you would typically store your waste water until you can get to a dumping station. But in tiny houses the weight restrictions and transporting the water, many houses are not on wheels, makes this prohibitive. Some owners install septic tanks but just as many tiny house owners are installing composting toilets or incinerator toilets which eliminates the black water waste issue. There are many creative and efficient composting toilets on the market today. But what about greywater? Greywater is the non-sewage waste water that comes from bathroom sinks, showers, and washing machines. As long as it hasn’t come into contact with feces, it’s probably greywater. Greywater is not clean in the sense that it contains soap, hair, dirt, bacteria, food, grease and other household cleaning products, but it is clean enough to be reused. If such water is released into lakes and ponds and other bodies of water it can pollute them, but plants and trees can filter the water and use the nutrients to fertilize themselves. Depending on the climate Greywater can also be filtered into garden ponds. Installing a greywater recyclable system is a great solution for tiny house owners enabling them to both get rid of their greywater and minimize water waste at the same time. Greywater systems can be very simple, both to construct and to use. Basically, all you need to do is redirect your waste water into your garden or landscape, so that it goes straight to the plants it’s going to water. That said, there are a few things you need to account for when you set up your greywater system. For one thing, the regulations concerning greywater are different in different areas, so contact your local authorities to find out what the situation is in your area. Once you understand the rules in your area, it’s best to have your greywater run outside straightaway. Storing your greywater for more than 24hrs. can cause the water to not only lose nutrients but to grow bacteria. It’s also important to ensure that the water does not come into contact with any humans or animals on its way to the plants, just in case it is contaminated. You don’t want your pets thinking it’s drinking water! You may need to play around a bit to ensure that your greywater goes straight into the ground, without pooling. It would also be a good idea to consider the types of plants you have, and to look into how much water they need and how often, so that you don’t accidentally drown them. Finally, once your greywater system is set up, make sure to only use natural, biodegradable household products such as soaps and cleaning products in your tiny house. You don’t want to put anything toxic like bleach or dye down your drains, because doing so will pollute the plants and soil outside. Recently named one of the top 10 Earth-friendly products on the market, Aqua2use greywater system filters wastewater from washing machines, bathtubs and showers for garden irrigation. A tiny house owner who installs a greywater system saves 1000’s of gallons of water per year by purifying and recycling your greywater into garden and landscape. Water is an essential and precious commodity. In many places water is becoming a scarcity and reusing your greywater is not only economical it is environmentally friendly. A primary benefit of using a greywater system is lowered water usage. Because it makes use of recycled water, it can significantly reduce your overall water consumption … and your water bill. During those warm weather months, you will have peace of mind knowing you can water your garden or lawn as often as you wish, without worrying about money swirling down the drain. You’ll be creating the water supply you need every time you take a shower or do your laundry. If you’re like a lot of your friends and neighbors these days, recycling is a part of your everyday life. You recycle cans, bottles, paper, car batteries and motor oil. By installing a greywater system from Water Wise Group, you can even recycle water from bathing or washing clothes that would otherwise go straight to a sewer or septic system. The Aqua2use Greywater System is fully automated and does not require any human intervention to operate, and it can be used with or without a pump. For low cost you can create a safe highly efficient greywater recyclable system for your tiny house. In conclusion the tiny house movement is helping to raise environmental consciousness. The idea of being able to build a tiny house that is completely sustainable is truly inspirational. A house that is solar powered, catches its own water, composts its black water and recycles its greywater is our present and future.